The RPF 7 step process. 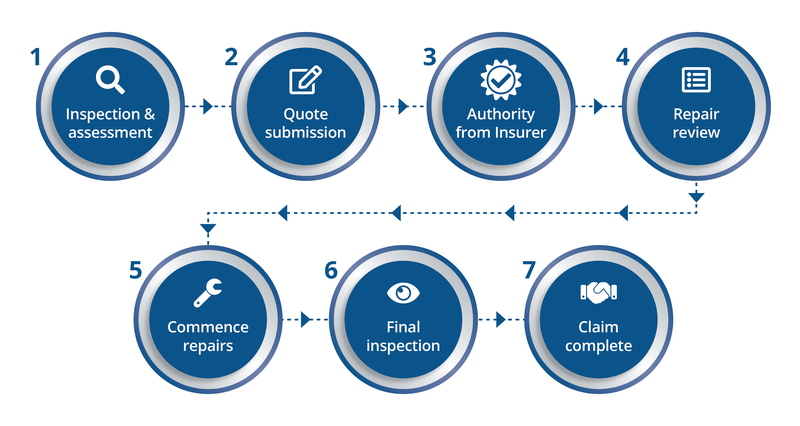 At RPF Building, we ensure the process is simple and straightforward to get your claim completed as quickly as possible. An RPF Estimator will contact you within 24 hours of your claim request being received by RPF. An appointment time will be confirmed with you for the inspection & assessment to be carried out. Once the inspection has taken place your quote and report will be finalised and submitted through to your Insurer. If RPF have your mobile number on file you will receive a text message to notify you that your documents have been submitted. Your insurer will then review these documents and a decision will be made on your claim and how it is to proceed. If your claim has been approved by your Insurer, RPF will be in contact to provide a copy of the scope of works and gain your approval to proceed with repairs. In some instances state legislation may dictate that a building contract has to be entered into. Please note that any contract entered into for insurance claim repairs will note that all payments are liable by your Insurer. On occasion we may be asked to collect excess on your Insurer’s behalf. Once you have authorised RPF to proceed with the approved scope and all legislative documents have been arranged an RPF Supervisor or Repair Coordinator will be allocated to your claim. The Supervisor/Repair Coordinator will review the works required and discuss commencement of repairs. Your Supervisor/Repair Coordinator will arrange the relevant trades to attend site and commence repairs. Throughout the entire repair process, you will have access to contact your Supervisor/Repair Coordinator as well as a Customer Service Manager (CSM) to answer any queries you may have throughout your repair process. They will also address any concerns you have along the way. It is a requirement of your Insurer and RPF that a final inspection take place on the repairs to ensure that all repairs are carried out to a high standard. You will be supplied with a Customer Satisfaction Form (CSF) which provides you with an opportunity to provide feedback on RPF’s performance. This form is then passed through to your Insurer. The CSF is able to be sent via text message or email. Upon the above steps all being completed, your claim becomes complete. RPF pride ourselves on our respectful, proficient and focused approach, causing as little disruption as possible to your daily life. If any questions arise after the repair process we urge you to contact us directly so that we may address your concerns or queries.